Our refurbished Intermec CV41 delivers the freedom and flexibility to work the way you want. It is perfectly-sized for forklift applications, reducing visual obstruction and simplifying installation compared to full-screen devices. Contact us today about buying, servicing, renting or selling CV41 gear! The CV41 is easy to standardize across your forklift fleet and resilient enough to handle tough distribution center environments. In addition, the CV41 offers the accuracy, productivity, and safety of hands-free voice directed work. In fact, it is the only Windows® CE vehicle-mount computer on the market with Vocollect VoiceCatalyst. Contact us today about buying, servicing, renting or selling CV41 gear! Another model of Intermec that offers a free environment in which user can do their work according to their own way. It’s highly recommended for forklift applications that reduce visual obstruction. 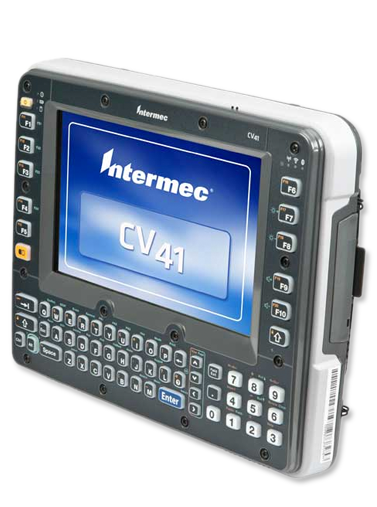 Additionally, the Intermec CV41 renders productivity, accuracy and other features that make it unique. You will get surprised that this is the only Windows CE vehicle mount computer with Vocollect VoiceCatalyst available in the market. It’s best to provide operator usability, ease of deployment and maintenance and much more.